75th Annual Sturgis Motorcycle Rally showcased The “Eyes of Freedom” traveling memorial which depicts 22 fallen Marines and 1 Navy Corpsman who lost their lives while serving in Iraq in 2005. COLUMBUS, Ohio - Aug. 18, 2015 - PRLog -- “The Eyes of Freedom,” Lima Company Memorial was on display at Mount Rushmore National Park during the Annual Sturgis Motorcycle Rally, which took place August 3rd-9th. The “Eyes of Freedom” traveling memorial depicts 22 fallen Marines and 1 Navy Corpsman from Lima Company, 3rd Battalion, 25th Marine Regiment, 4th Marine Division who lost their lives while serving in Iraq in 2005. This traveling installation further reiterates a symbol of freedom and sacrifice. Hundreds of thousands bikers descend onto the small town of Sturgis, South Dakota for the annual Sturgis Motorcycle Rally, but this year marked the 75th anniversary and attendance boasted 1.5 million motorcycles. In addition to countless activities surrounding the weeklong event, large groups of bikers take day-trips throughout the Black Hills and beyond to several attractions including one of the most iconic symbols of American freedom and democracy; Mount Rushmore National Park. New elements have been added to the “Eyes of Freedom” Lima Memorial since the initial completion and 2008 unveiling. Heavy steel frames have been replaced with aluminum frames and a video accompanies the exhibit which highlight the past seven years of being on the road. An additional painting has also been added, depicting three support Marines who were also killed in the same 2005 incident: Cpl. David “Bear” Stewart of Bogalusa, Louisiana; LCpl. Kevin Waruinge of Tampa, Florida and Sgt. Bradley Harper of Dresden, Ohio. Created by artist Anita Miller of Columbus, Ohio to honor the Ohio-based Marine Reserve unit, once known as “Lucky Lima,” one of the hardest hit units in Operation Iraqi Freedom. The memorial contains life-sized paintings of each of the 26 fallen heroes. Names and statistics of each of the fallen men, an ever-living candle, boots and space for visitors to leave mementos make up this moving memorial installation. 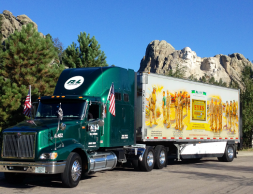 Official transportation provider R+L Carriers has made national growth possible and since 2011, the Lima Company Memorial has been viewed at over 150 events across the nation.